A quick pick of some good characters . Alright, so today’s a more informal post for the first time in a while. I’ve been banging out a lot of reviews, so with the year coming to a close and 2019 starting, it seemed like a fun idea to look back on 5 characters I really liked from things I watched this year. That could be movies or shows, East or West- but animated, as always. (Before anyone asks: Killua is an all-time favorite. There’s also a character piece I did. Check it out if you haven’t!) There was plenty to choose from, as it’s been an action-packed year of viewing, so here we go! 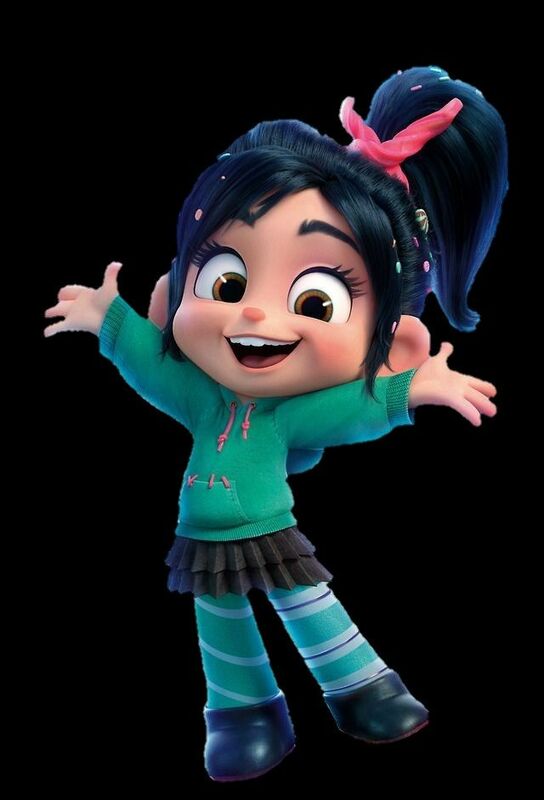 Honestly, I could (and probably will) give the sweet little racer from Disney’s Wreck-It Ralph films the full “What’s in a Character” treatment at some point, especially with 2 full movies’ worth of excellent character development, but Vanellope re-entered the scope of my mind with the sequel. A superbly fun character (voiced by Sarah Silverman, of all people) with a terrific dynamic that she has with Ralph, the regent of Sugar Rush is a surprisingly complex character, bundled into an adorable bundle of messy hair, a signature green hoodie, and boundless energy. Nichijou, while a 2011 release in real-time, came into my life in a big way in 2018. While the many charming, quirky characters on the cast might all warrant some kind of mention, Yukko’s brand of terrible luck, persistent attempts at humor and futile battle against schoolwork all while never giving up is something to behold. 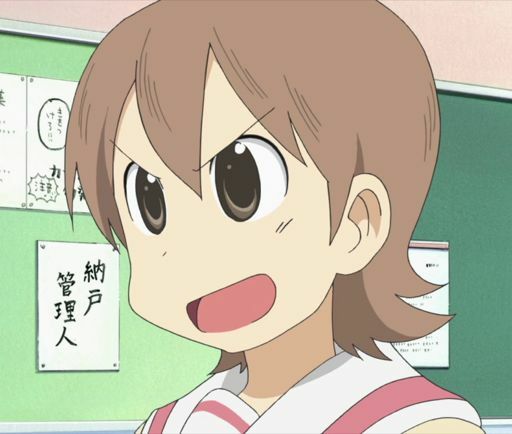 Silly as Nichijou can be, it has smart moments of some pretty deep and touching stuff, and while Yukko isn’t a genius, she is someone who can be a great friend- and it’s through her actions that the robot girl Nano Shinonome is able to find comfort in the transition to being a schoolgirl, and her surprisingly up and down relationship with Mio Naganohara is a great joy of humor to watch unfold. Beyond the anime public’s adoring gaze upon Rikka Takarada and Akane Shinjo, the breakout character of this cast was none other than this man- a one-time kaiju whose initial casting drew a strong resemblance to Viral from Gurren Lagann. 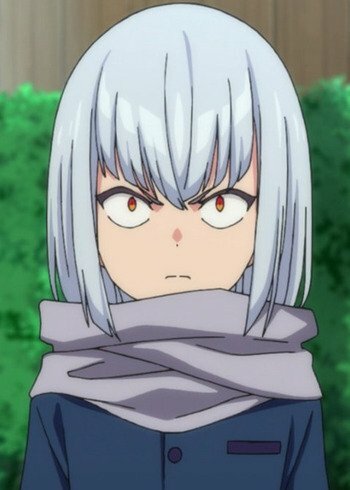 As time went on though, Anti’s varying hardships, coupled with his persistence in his goals (which originally was a single-minded, and I do mean single-minded obsession to destroy Gridman) found him both a strangely sympathetic character and a likable one who also delivered some major hype in a show you’d expect to have plenty of it. By the end of Gridman, Viral has undergone a complete character arc and transformation- and that, perhaps more than anything else in the show, is why he’s on this list. The youngest member of the Parr family had his big-screen coming out party this past year, where he transformed from a bit part in the original Incredibles film to a more active role, with a great deal of comedy and humor. 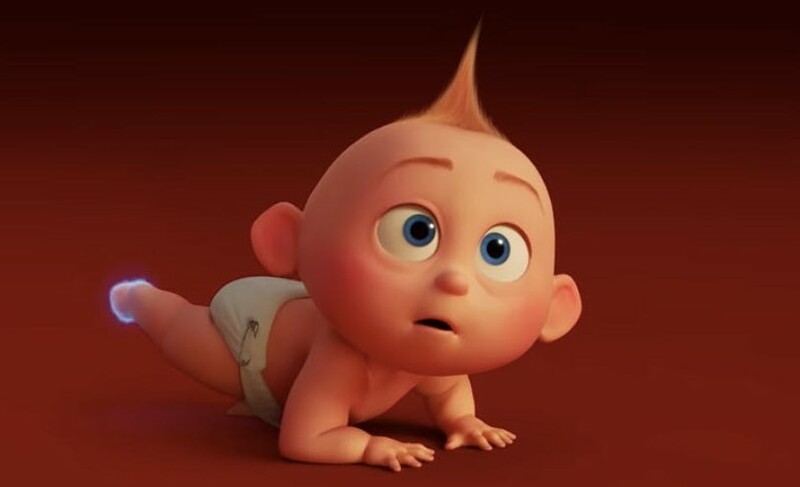 From his backyard brawl with a raccoon to his unlikely heroics at the climax of Incredibles 2, Jack-Jack was about as humanly entertaining as you can make a baby character without him becoming annoying. No small feat there. Father to the adorable Tsumugi in this sweet little slice of life anime, Kōhei struck me as interesting precisely because of his balancing act between being a good father (in the stead of his recently deceased wife) and his career as a teacher, which was handled with a lot of tact and care. While this show released back in 2016, it’s still worth going back to take a look (and here was my review of it.) This man’s selfless care, despite all the challenges he faces regularly, is a treat to watch, and a character archetype that seems far too scarce at time. Good dads (and parents) are never out of style! So there’s my pick-5 for the past year. I hope everyone had a great 2018, and here’s a happy New Year as we get into 2019! I’m looking forward to another fantastic year here on AniB Productions, and to the excitement of my readers as they continue to grow. Feel free to leave a comment! Day 14! We’re officially over halfway to Christmas Day, believe it or not. Today’s piece delves into one boy’s interpretation of that most holy of days in perhaps one of the more truly creative specials out there’s- that’s right, it’s time for Huey Freeman to bring The Boondocks’ special to life. The Boondocks is a show I’ve been meaning to talk about and review on here for a while, but the opportunity never quite presented itself. While a more formal review will still come along at some point, this biting, irreverent, yet very funny show did have a famous Christmas special of its own- and that of course is the topic of the piece at hand- the time Huey Freeman, the main protagonist pictured on the right in this post’s picture- was tabbed to produce his school’s Christmas play. Featuring the usual Boondocks style of humor and pacing, this special was actually just another episode in season 1. As far as the premise goes, Huey manages to get fully creative control over his class’s play after being initially reluctant when offered by his teacher, and despite having grand sweeping visions of how to produce and perform it, there’s two things that stick in the craw of the powers that be, namely a) the phasing out of students for professional actors in a school play and b) Huey’s creative choice to have a black baby Jesus. The former is something the boy manages to achieve, albeit with some later regret, a full scale PTA protest and boycott, and a lot of string pulling (seriously, just how does he manage to get a bunch of A-listers for such a play? ), while the latter proves to be such a radically different vision from what society normally views that it actually compromises the wide public release and attention our protagonist attempts to get for the production at one point. Along the way, both Huey and those involved raise questions about what the season really means, often obfuscated by consumerism, greed and the delicate pull between people and giving what they can, vs pouring everything into something because of the belief you have it (like Huey and his play). In the end, the boy moves on, with a somewhat narssistic attitude about not “looking to the past”- a great irony considering the holy and centuries old origin of what Christmas is. The B-plot involves a rather humorous, albeit violent handling of Riley Freeman’s anger at Santa Claus for never delivering new rims from years ago, culminating in an assault of a mall Santa and the young man threatening him. This plot blends into neighbor girl Jazmine’s belief in Santa Claus, culminating in Huey’s younger, ruder and more naive brother returning again to attack the stand in Santa- Uncle Ruckus (a recurring character in the show who in true Ruckus fashion, is working yet another odd job.) Again, while dark comedy, this part of the episode also shines light on the effects of consumerism, the mythos of Santa Claus vs the commercial reality people have put in front of them…and of course an excellent excuse for more of the irreverent humor The Boondocks is known for. As always, this episode is the best of this series in a nutshell- a biting sociopolitical commentary that manages to be both thought provoking and quite humorous. It’s a mature kind of humor, but the kind that might just give you a big laugh at this time of year, provided you’re old enough. There’s a bluntness and crudeness to it that also won’t fit everyone, but it feels real, in a word- perhaps not the characters, but some explorations of how people treat traditions and differences culturally, around this holiday season. Heck, it even takes its own stab at the belief of a child in Santa Claus’s existence, which is an oddly pure belief based on something generally beyond logic and reason called faith. There is an evocatively interesting heart beating beneath it all, and as Huey’s play opens to marvelous, albeit limited audiences and reviews, there’s this moment of both a vision realized and a reality that won, all at once. It’s really something in its own unique way. Like what you see? Big fan of The Boondocks or this episode? Leave a comment! The wild Italian adventure of the classic thief and his friends. Day 9! In practical terms, it’s the second Sunday of Advent, and in AniB terms, we’re over 35% into this calendar countdown. Once again, today’s pick veers slightly off the Christmas path in favor of a recent iteration of a classic anime/manga series from Japan- it’s none other than Lupin the 3rd, or Lupin III, or any other variant of that name you can come up with. In Italy, there is a rich tradition and connection to the ideas of Christmas. This is probably in no small part due to the location of the Vatican and the heavily majority Roman Catholic population, but also because of numerous saints, popes and iconic churches from over the centuries. However, today’s review is about a very different sort of Italian adventure- that of the master thief Arsene Lupin III and his quest for the greatest treasures of the historical peninsular boot. Lupin III is actually a famous, older Japanese manga that has had several iterations in anime over the years, and this was until this past year (2018) the most recent foray, until Part 5 came into being. Fortunately for viewers unaware of Lupin’s existence prior to this show, it does not require any sort of background knowledge of prior events or previous tales in the franchise to thoroughly enjoy and follow, which is quite nice- as heavy lore can often bog down long-running or expansive series when it comes to new participants. In the case of Lupin III’s Italian adventure, it’s a delightful blend of high-stakes missions and chases, unusual twists, some heavy influence from the James Bond franchise, and a number of competing character arcs that all come to a head in an unforeseen way. Through it all, Lupin has trusted right hand Jigen – master marksman- at his side, and is also joined at time by Goemon Ishikawa III, a master swordsman trained in the way of the samurai (and he gets some crazy feats with his blade), as well as Fujiko Mine- Lupin’s on and off again romantic interest and one of his closest associates. That said, Fujiko’s a woman who does things on her own terms, and she’s not afraid to play dirty to get what she wants in terms of the treasure, making her more of a friendly allied party with her own self-interests to Lupin’s usual capers. Of course, no great thief has made it without a worthy adversary- and that role is held by Inspector Zenigata, an Interpol agent whose life’s work is to pursue and capture Lupin, something he carries out with unabated zeal and a surprising amount of humanity. For me, Lupin III being introduced through this show was a satisfying experience, and the arc itself is a fun adventure, combining both elements of stand-alone episodic pieces and a larger overarching story, narrative and character development. It’s a delightfully refreshing watch as well compared to a great number of other modern anime that exist; it’s not about schools, cute girls, generic shonen battles (though there are some terrific fights), or any of that (which is still great, don’t get me wrong); it’s got a style all its own, and it has fun doing it. And I think most people over the age of 13 would probably have a lot of fun with Lupin’s adventures as I did, and The Italian Adventure is a terrific show to enjoy and perhaps launch into the franchise. Animation: Modern 2-D anime. That said, Lupin’s got some style that feels almost a bit like Western comics or animation for the most part, but quality, and in a way it just evokes that thriller feeling throughout the show, which is terrific. The colors pop, the character models are distinct and attractive, and the aniamtion here makes a difference in bringing the style of the series to life. 4.75/5 points. Arsene Lupin III is the descendant of the famed Arsene Lupin of literary fame; like his forefather he’s a master thief who can and will steal any treasure that strikes his fancy. He’s so good that various police and law enforcement agencies the world over have not only failed to stop him, but even trace him for the most part…except Inspector Zenigata. Lupin’s got a keen intellect, a weakness for women, a surprisingly affable nature, and is a pretty good shot himself, despite having Jigen around. Speaking of which, Daisuke Jigen dresses like a mafia hitman and has the style of one too- he’s a cool customer with a gun, his signature fedora draped over his eyes. Lupin’s main partner in crime, he’s a reliable hand with some more common sense than his friend (though they’re all slightly crazy), has a liking for a smoke and a good drink, and is reliable on big missions. Goemon as mentioned in my thoughts is a master swordsman. A man of few words who follows his own code, he is a frequent ally of Lupin’s main team and provides some terrifyingly strong combat support to missions. He also brings a bit of traditional Japanese flair to a decidedly non-Japanese anime, which is interesting in itself. Finally, the usual main cast is rounded out by Inspector Zenigata, a man with a zealous conviction to bring Lupin to justice and the eyebrows to match. Called “Pops” affectionately by his archenemy, this Interpol agent relentlessly pursues the master thief to the ends of the earth, without ever slowing up. Despite this, he’s shown to be a good man with a lot of heart, and some surprising skills, such as cooking. This arc of Lupin III also has other key characters introduced that are new to this iteration of the franchise, in particular Rebecca Rossellini, a rich young Italian woman who is also quite famous from her modeling, acting and business endeavors in-universe- but who is actually interested in the thrill of the heist; and Nyx, a mysterious special agent who no doubt has inspiration from a certain MI6 agent who’s famous the world over…. The character development is good, the cast is small but adequate and it gets the job done. 4.5/5 points. Story: Both episodic and overarching in nature, Part IV chronicles Lupin’s unusual adventures and endeavors mostly in Italy, which gets him dragged into a much bigger secret than any one treasure or heist…and it’s pretty crazy. Overall, the story works, even if it does have some flaws, but most will be no doubt entertained, without spoiling anything. 4/5 points. Themes: This show isn’t really a moral compass for anything so much as it is for pure entertainment. You could argue there’s some stuff in here about what true love actually is vs just the business of convenience, or how one can fulfill one’s life purpose, but this might be the weakest part of the show on some level. It’s odd, considering how engaging the overall product is. 2/5 points. Don’t Insult The Viewer: Lupin III will probably be best enjoyed by a slightly older audience, but in saying that, it is extremely accessible to pick up and enjoy, with a unique aesthetic that evokes all sorts of thoughts from high-speed police chases to the sort of mental hijinks you find in a great mystery, and even the elements of science fiction and spy flicks come in. Truly a fun watch. 5/5 points. Overall: 20.25/25 (81%): For fans of old-school heists and hijinks, creative capers and plenty of action, humor, mystery and trickery, Lupin III is a great series to pick up, and this part is a nice starting point and a fun show. Lupin has a way of stealing hearts and treasure, you know…. Like what you see? Want to talk about Lupin III? Leave a comment!